13-Sep-2015 -- This is the second out of 4 reports reaching confluence points during a bicycle trip through Southern Spain. The story continues from 37°N 4°W. In Granada, I decided to directly approach this confluence point by Europe’s highest road to the Pico Valeta with its height of 3392 m. Although a heavy thunderstorm made me freeze in Granada, I made an attempt to cross over the pass. I spent the night in Sierra Nevada at 2150 m altitude, which is a ghost town during the summer when there is no skiing. I didn’t sleep well in the night, not knowing whether I would make it across or not. I hadn’t enough cloths with me, the weather was questionable and if I would not make it across, I would have a timing problem when riding around the huge mountain range. The next morning I succeeded in riding to Pico Valeta at a height of almost 4300 m. I descended on the southern side and rode along several mountain villages until I reached the little village Picena. I parked my bicycle at the public washhouse in 400 m distance and hiked to the confluence location. 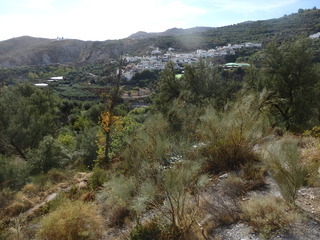 The confluence is in a wilderness area right next to an olive grove. There are agaves, various bushes and 3 m below there is a water channel for irrigation. Right after the visit, I continued riding towards Almeria, spending the night in El Ejido which is 3300 m lower as the Pico Valeta. The story continues at 37°N 2°W.